We prepared Energy and Sustainability Statements to support three simultaneous planning applications for the redevelopment of the Elmington Estate, which were submitted in September to the London Borough of Southwark by Bellway Homes (Thames Gateway) and Family Mosaic. In 2012, Bellway Homes and Family Mosaic were selected as the London Borough of Southwark’s development partners for the development of 225 private and affordable homes at the Elmington sites. Included in the development proposals were a number of specific environmental sustainability features as recommended by us. These included advanced fabric efficiency measures, combined heat and power (CHP) and solar PV to achieve a 50% reduction in predicted on-site CO2 emissions. 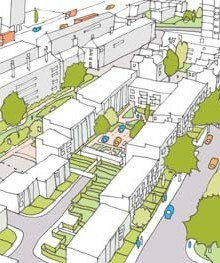 The development has also been designed to exceed Code for Sustainable Homes Level 4, by targeting a point score of 75, and will exceed the mandatory energy requirements for Code Level 4 – therefore also going beyond compliance with the London Plan. We also prepared the required reports to support the discharge of the acoustic planning conditions, as well as providing acoustic consultancy to improve sound insulation and quality of wall and floor construction.